Whether you need replacement or new construction windows, you’ll want to take advantage of mild spring weather. If you are interested in replacement windows for your home, you’ll want to call your local window contractors as soon as possible. New windows are an investment in your home, which is why it’s worth your time to explore different window styles. If you are unsure what types of windows would best complement your home, reach out to your local window replacement company. A single or double hung window moves up and down to let in fresh air. These windows have moveable panels (sashes) that let you take advantage of the cool breeze outside. Kitchens, bathrooms, and other rooms with high humidity greatly benefit from the extra ventilation you can get with windows. If you have a window air conditioner, you’ll want to ask your local contractor about installing a double or single hung window. These sash windows are perfect for holding air conditioning units in place while they cool and dehumidify your home. When you’re ready to clean your window, simply tilt the sash for better access. Similar to sliding patio doors, a sliding window moves along a track. We’ve noticed more contemporary style homes starting to use horizontal sliding windows. However, many people decide to install sliding windows in traditional style homes because they are easy to open and close. Ultimately, what windows you choose for your home will depend on your budget and unique design preferences. You’ve probably seen casement windows on either side of a bay window. You will need to use a crank to open and close casement windows. Since crank out windows swing outwards, you may need to trim nearby bushes and trees so they can open fully. In general, casement windows offer more ventilation than other types of windows. A fixed window can’t be opened or closed, but they provide beautiful views of your front or backyard. 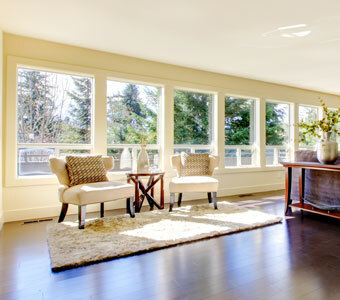 Fixed windows also flood your home with natural light. While fixed windows take advantage of gorgeous views, they can also help make small rooms feel more airy and spacious. A fixed window is often paired with functional windows on either side so you have the benefit of natural light and fresh air. While a picture window can’t be opened, they are perfect for showing off the view outside your home. For example, you may want to install a large picture window to show off your home’s view of the lake. A picture window is unique from other window types because it’s made from a single pane of glass uninterrupted by lines. If you want a large picture window for your home, we recommend exploring energy efficient options. Energy efficient windows help you save money in the long run on heating and cooling bills. Our Portage window contractors work hard so you can enjoy your new windows as soon as possible. We are proud to serve Portage, Kalamazoo, Battle Creek, and surrounding areas. To schedule an estimate for home window replacement, call Abode Building Center at (269) 329-1800.